Intended for use with woodworking projects. 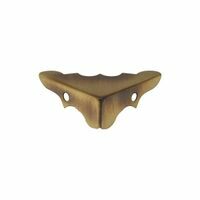 For durability, this furniture bracket has added gauge thickness and a solid brass construction. Designed to prevent screws from stripping. With brass screws. Intended for use with woodworking projects. For durability, this furniture bracket has added gauge thickness and a solid brass construction. Designed to prevent screws from stripping. With brass screws. 5/8" x 1-3/4". With screws.